Ever wish you could commiserate with other farm dreamers? A place where you could find a community of existing farmers, aspiring farmers and foodies alike? Starting tomorrow (or today if you visit the Facebook page) you’ll be able to do just that. 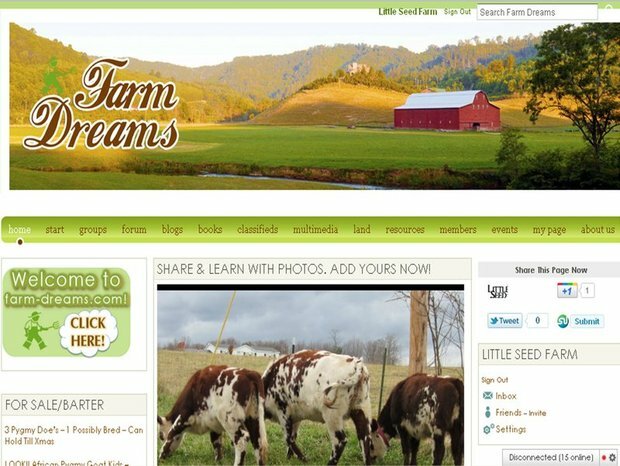 Boasting a multitude of farm-related groups, forums, and other social applications comes Farm Dreams, a new social networking site dedicated to all the farm dreamers out there. In addition to the groups, forums, classifieds, and other resources, there will be a daily blog post from five dedicated bloggers. I’ll be posting on Mondays about the ups, downs and sideways of starting a farm. You can find me under The Aspiring Farmer Blog, which begins this Monday. The rest of the week you'll be treated to tips on homsteading, survival skills, cheesemaking and commentary on food law (legalize raw milk anyone?). Get over there and take a look, it doesn’t disappoint.